Scholastica had a brother that everybody had heard about. In fact, he was her twin brother and his name was Benedict. Benedict was the founder of the Rule of St. Benedict and the source of a monastic group known as Benedictines. Yet, Scholastica was reported to be every bit as devoted and pious as her brother if not more so. Yet, as a woman in the sixth century her options were severely limited. 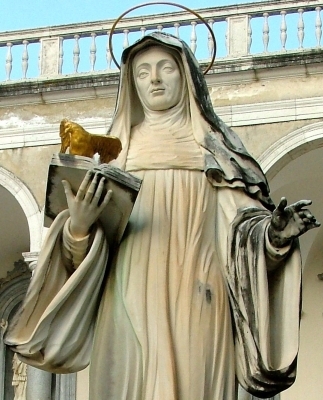 She became a nun because of her incredible devotion and faith and eventually became abbess of a community of women who followed after the rule and way of life that Benedict had discerned and pioneered. Her leadership was capable and inspired and she was known for the passion that she brought to a life of prayer and work. This passion was an inspiration to the women she led. It was her practice to meet once a year with her brother to discuss the spiritual life and to read scripture together. The communities that they led were only five miles apart but they met on some neutral ground partly to emphasize that there was some special connection between brother and sister that was worth honoring with a change in location. The last time they met they weren't certain that it would be a final meeting but Scholastica was aware of her own failing health. They met for longer than they ever had and even longer than they had intended to meet. They discussed scripture. They prayed together. They broke bread and communed with one another. They encouraged and challenged each other as only a brother and sister in the Faith can. Then, as night was falling Benedict got up to go and return to his monastery where he might rest in his cell. Scholastica asked him to stay even longer so that they might continue in their fellowship--perhaps she even intuited that this would be their last chance. He insisted that he must return home as it was his calling to be there. She simply nodded, folded her hands, and began to pray. She responded simply: "I asked you and you would not listen; so I asked my God and he did listen. So now go off, if you can, leave me and return to your monastery." With these words, she began packing up her things knowing very well that he would now stay but she wanted to indicate to him his freedom to choose. Benedict stayed with his sister and they talked later into the night. Shortly thereafter, Scholastica died and Benedict mourned the loss of his sister but thanked God that he had had a little more time with her.